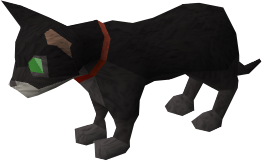 Cats aren’t just a four legged furry XP waste, they’re also responsible for a number of international peace treaties, the collapse of three world banks and the success of the internet. Let’s celebrate all things RuneScape, all things internet and all things cats in one happy bundle of a photo competition. We’re looking for the best RuneScape owner’s cat photos ever. They can be funny, they can be cute, they can even be scary – we want them all! 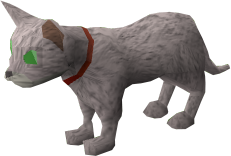 Entering the competition is easy - tweet a picture of your cat to Mod Jane (@mod_jane) and myself (@modpaulm) using the hashtag #runecats. You’ve got until 9am (UK time) Monday October 8th to enter. Anything we get after that we’ll look at of course (it’s a cat photo after all) but won’t be included in Jane and I’s tough voting process. Dogs/children dressed as cats don’t count! the internet would be lame. Don’t worry if you don’t have a cat. There’s a special award for those non cat entries we receive. The best of luck you all! Hrmm, no cat.. But a blue tongue lizard? Absolutely. Awesome. Really looking forward to it... my two boys however do not look impressed hehe. Jog on kitty! I will dress up my dog.. I mean cat! as a cat and enter this competition! .... *sigh*. What about cats in cat costumes? Does that double my prize? Entered my kitten Would be awesome if you made a gallery of them somehow. Can we enter more than one picture? I have a few cute pictures of my kitty. I can't decide which one to enter. I am soooo looking forward to this!!! Bring on the kitties! ^ Don't forget the various other creatures and critters dressed up as kitties!